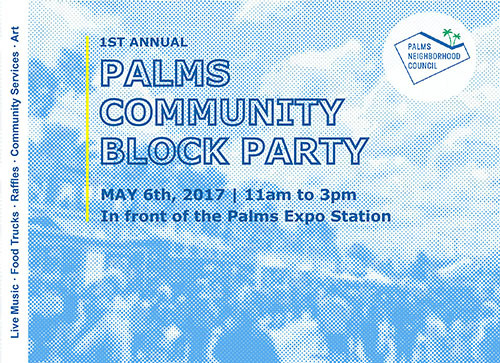 Join us on May 6th for the 1st annual Palms Community Block Party from 11 am to 3 pm, in front of the Palms Expo Line station. Admission is free and open to the public! It’ll be a day filled with music, food trucks, free raffles and great prizes, an obstacle course jump house, and live entertainment! This will be an amazing opportunity to meet your neighbors, learn more about community services, and meet elected representatives while enjoying great food and entertainment. UPDATE: We’re thrilled to announce Phillyfornia, Marcel Waffles, Seoul Sausage Company will be joining Palms Community Block Party! Plus we’ll be having a free raffle give away with fantastic prizes – such as a free oil change courtesy of Gilbert’s Auto Repair and a free massage courtesy of Raindrop Bodyworks.